1. 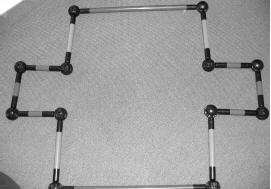 Using two 36” tubes, four 16” tubes, six 11” tubes and 12 spheres, create a rectangular “playing field” with two goals at each end. See the picture below. 2. Place the playing field either on the floor or on a table. Set and review basic guidelines of the game prior to beginning. Incorporate the student’s ideas for rules into these guidelines. For safety purposes, be sure to allow frequent rest breaks to prevent dizziness and light-headedness. Be sure to stop the game if a player is feeling dizzy or light-headed. Be sure to involve parents, siblings, teachers, para-educators or other support staff in this activity! It may provide them with fun activities to do with children. 1. Sit down in a circle with the players of the game (if this is an individual therapy session, sit across from the child on the floor). Once the rules of the game are reviewed, ask students to repeat them to ensure understanding. 1. 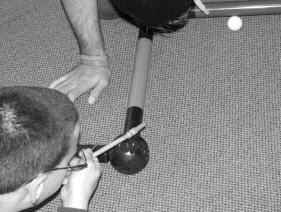 The purpose of this game is to blow the ping pong ball into the other player’s goal. Wait until you are given the sign to go to begin playing. 2. If you need to sit down or take a break, say so at any time and play will resume when all the players are ready. 3. When playing, all hands, arms and other body parts are to stay off the playing field. 4. There is no goalie, and to block a goal, you must blow the ping pong ball away from your goal cage. 5. You must always stay on your side of the playing field. Do not cross over the center field line. 6. Be respectful. Only say encouraging words and cheer each other on. 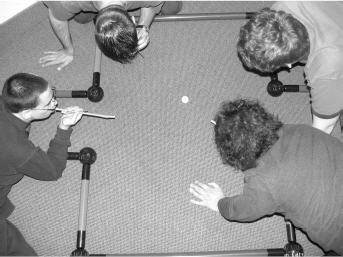 Challenge: Holding the straw in your lips, blow the ping pong ball into the other player’s goal to score as many points as possible! 4. Each player should take their position on opposite ends of the playing field. 5. Decide on the end score (for example, the first person to five wins). 6. If working in a small group, instruct the players to huddle up to plan their offensive and defensive strategies. 7. Begin with the ping pong ball in the center of the playing field. Countdown “3-2-1, play!” And the players should begin blowing the ping pong ball into the other team’s goal. 8. Provide reminders to the players if they are not following the guidelines. 9. Once a goal is scored, return the ball to the center of the playing field and begin again until the end score is reached. 10. When the activity is complete, move on to the Discussion and Processing questions. Was the child able to follow the auditory instructions of the game? Was the warm-up routine alerting? Did he/she appear to be better able to attend to the auditory instructions? Therapist Tip: Try completing this activity (at the same time of day, in the same location, and track the data) a few times without the pre-game warm up and a few times with the pre-game warm up. Document if there is a difference in performance with the pre-game warm-up. A child may or may not need this routine to prepare for learning prior to completing seated academic work. Was he/she appropriately communicating wants/needs, thoughts, or ideas to the teammates, the opposing players, and to the staff? How did you feel after you successfully made a goal? How does your body feel after moving around and playing this game? Use the straws as hockey sticks. This also incorporates the use of fine-motor skills in order to manipulate the straw in the hand. If working in a small group (3 to 4 players – may include the therapist), blindfold one player on each team. The other “sighted” teammate must communicate where the ball is and where his teammate should position his/her body in the playing field in order to score and/or block the ball. 3. For children who use wheelchairs. Set up the playing field on a table so the wheelchair can fit under the table. Follow the same activity instructions as stated above. Also, the child should transfer (with or without assistance – depending on ability) to the floor and lie prone with his/her upper body propped up on forearms so weight is bearing on the upper extremities in that manner. If a group is a combination of children who both use and do not use wheelchairs, instruct all children to lie prone on the floor and play the game in that position. 4. Consult with the speech therapist. Consult with the speech therapist on the professional team to change the size of the straw, eliminate the use of the straw during the game, or to use another oral-motor tool to challenge the children based on their needs.